If you would like to transform an animal's life but do not have the space or time to adopt one directly, you might like to consider sponsoring. 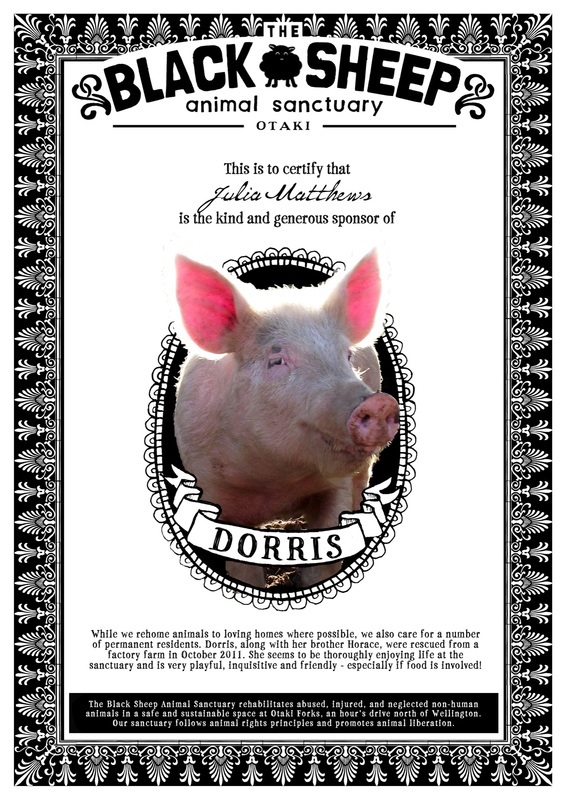 (b) generously helping our pigs, roosters, or cows through a general 'friend' sponsorship payment which will be used wherever we have the greatest need. Both options involve making a small regular payment to the Black Sheep towards the cost of food, vet bills, hoof and coat care, etc. In return you can feel proud that you are making an enormous difference to animal lives. You will also have the opportunity to visit the animals at the Black Sheep during our summer working bees, during which you will be offered a tour of the sanctuary. You will receive an 'adoption pack', including a sponsorship certificate and regular email updates about the sanctuary animals. The animal sponsorship scheme enables us to help more animals through the Black Sheep Animal Sanctuary. We are only able to care for animals because of the support of people like you. Words cannot express our gratitude for the support that such generous people give. 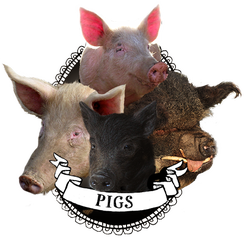 We care for an increasing number of pigs - refugees from factory farms, pig breeders, babies whose mothers were shot - or just homeless and unwanted. Your support enables us to help these beautiful, intelligent, and playful animals. The Black Sheep cares for around 50 roosters, who would otherwise have been killed or abandoned. 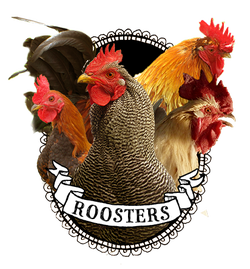 Vast numbers of roosters are slaughtered as they crow and do not lay eggs. Your support will help these beautiful boys live in safety. Our cows all have difficult pasts - one was a bobby calf who faced slaughter, others would have gone into the dairy industry, enduring continual pregnancy and the loss of their babies. 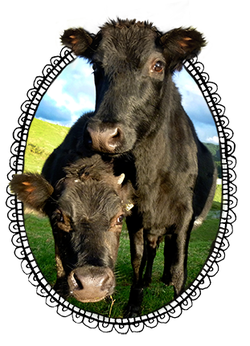 Help from generous sponsors enables us to care for these lovely cows, and ensures they can live happily ever after with their friends. 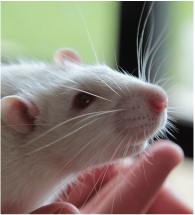 We have eight beautiful rats, who were rescued from an animal experiementation laboratory. Despite enduring psychological experiments in the past, they are now enjoying life at the sanctuary, in their purpose built rat castle and playgroud. They are friendly, intelligent little people, and your support helps us offer them a secure forever home. Ronan the goat was neglected and then abandoned, along with his best friend Mackay the ram. A kind couple rescued them, but the dynamics weren't working out with their other animals, so Ronan and Mackay have both come to the Black Sheep, where they have lots of other sheep and goats to hang out with! 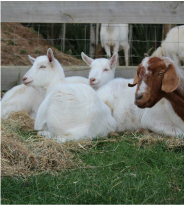 Merge was born on a goat dairy farm but as a non-milk producing male, he faced death. He and his brother Zip were rescued as day-old kids by the Three Little Pigs sanctuary, and found a safe home at the Black Sheep where they enjoying playing with Bo, our rescue lamb. 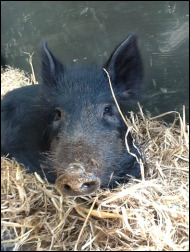 Larry is a handsome but shy kunekune pig, who began his life as a house pig. However, when his caregivers had to move and couldn't look after him any more, he narrowly escaped slaughter. He arrived at the sanctuary in December 2015, and is gradually settling in to the sanctuary and getting to know the other pigs. Before she moved in with us Streaker's life was a succession of crises. She began her days in a mobile petting zoo. Luckily ak ind-hearted family took her in, but when their life circumstances changed they could no longer look after her. Streaker ended up with a pig farmer, who kept her continuously pregnant for two years. 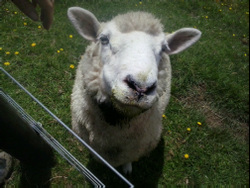 When she was about to be slaughtered, her original caregivers got in touch with us, and she moved into the Black Sheep. She is slowly but steadly recovering. Our beautiful young Roscoe began his life on a dairy goat farm. As a boy, he would have been killed because he didn't give milk, so a very kind person rescued him and brought him to the sanctuary. Brian is an adorable young Captain Cook piglet. Some very kind people found her in the wild as a small piglet. She was near death. They brought her home and managed to save her with lots of loving care. 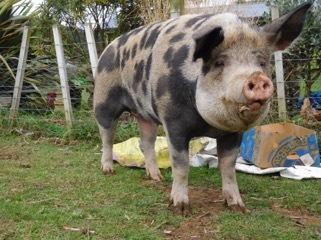 However, as she got bigger, she needed a new loving home with more space, and other pigs. She has settled in well at the Black Sheep - although still quite shy (as she was originally wild), she now enjoys a tummy rub! Soybean is the beautiful sheep on the right - she's standing next to her large lamb Sorrel, who is all grown up now. Soybean was already pregnant when she arrived at the Black Sheep, and quickly settled into the herd. Simon is a very handsome young rescued goat. He is still quite timid with humans, but is slowly gaining confidence. He loves hanging out with his goat friends and climbing on the goat playground. ​Our lovely ex-battery hens arrived in late spring, when the weather was still cold, and we made them small jerseys until their feathers grew back. They are fully feathered now, and happy and confident sanctuary residents. Zip was born on a goat dairy farm but as a non-milk producing male, he faced death. He and his brother Merge were rescued as day-old kids by the Three Little Pigs sanctuary, and found a safe home at the Black Sheep where they enjoying playing with Bo, our rescue lamb. Betty Boo and Mary-Ann are sisters, and arrived in the winter of 2015 along with Moby. Betty Boo is quite timid but has gradually become more curious and confident during the months she has been at the sanctuary. Mary-Ann is the braver sister, and has become best buddies with young Roscoe. Together the two are very playful, and get up to all kinds of mischief. Thunder is a miniature pony with attitude, and one of our earliest residents! He was neglected before becoming part of the Black Sheep, and didn't like humans very much. Ongoing problems with laminitis have also affected his life. However, after much treatment and a special diet, he is much more comfortable and is revelling in the company of his new friends Lilly and Chester. Goatee is a rescue goat who came to us via Lindale Farm. He is a beautiful gentle soul who loves people, knows his name, and is gradually making friends with the other goats. 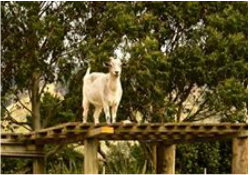 Lovely Sprite is an adventurous free spirit who enjoys playing with the other goats, climbing and exploring. Here she is testing out the new goat playground. Mackay the ram arrived at the sanctuary in the autumn of 2016 with his best friend Ronan the goat. 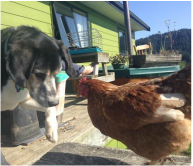 Both had been neglected and abandoned, before being rescued by a kind couple and finding a new life at the Black Sheep Animal Sanctuary. Here he is with a friend on each side. Hotlips is a lovely, confident boy who was rescued by some kind folk. 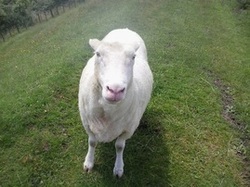 Eventually, however, they needed to find him a new home, so he and his friends came to the Black Sheep Animal Sanctuary.